I believe I’m getting there. The deer most people see during deer season are most likely lashed to vehicles, headed for butcher shops. The stories nonhunters hear are often those of successful hunters eager to recount the details of their hunt. 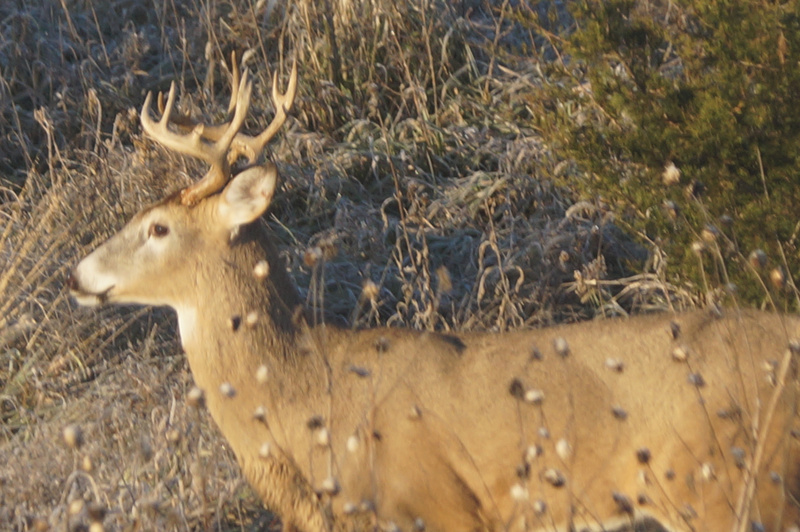 What most of us do not see evidence of, what we do not hear about, are the intensely private thoughts of deer hunters. I have been talking to deer hunters, and sprinkled among the stories of big bucks and successful camps are the reflections of another kind of deer hunter. I was talking to a friend of mine, an avid hunter, the other day. I happened to ask him if he’d been out deer hunting. I didn’t need an explanation for that, but he felt compelled to give me one. That’s how deeply ingrained deer hunting is in northern Minnesota’s culture. He first wanted to assure me he had not become an anti-hunter. He mentioned that twice in fact. This was his story: He had shot a beautiful big buck last fall, and when he had walked up to it after killing it—well, something didn’t feel right. He stammered a bit, trying to explain what he felt. I have heard the same kind of story from other hunters through the years. I understood what he was feeling. For some hunters, there comes a time when killing another deer becomes unnecessary. This is not to say this man won’t hunt deer again. He may. But for now, he’s not a deer hunter. I talked to another serious hunter a few days ago. He has been out for other species much of the fall. But again last fall, he did not hunt deer. He used to hunt deer, walking about in the woods, tracking, sneaking, matching wits with the animals. At some point, his group turned to hunting from stands rather than walking. In one of those early stand hunts, another hunter, on the ground, had pushed a nice buck in front of my friend. He couldn’t shoot it. I haven't been in over six years or so. Some is due to where I live, some due to my medical condition. I thought I was going at least once last year, had my stuff ready to pack into the car to ride to my son's house, but I just didn't go. A few years ago I was going hunting. It was just a few days after my Dad passed away and we had a memorial for him at my sister's house in Pensacola. I was standing just outside of my truck and I noticed a buck walking in a gully. I watched him for about five minutes, the area had been clear cut and he headed for a small cedar tree. He looked around and bedded down. The wind was blowing and I knew that he had no idea that I was watching him. I got down and started a slow stalk. I got close enough for a good clean shot and while lining up my sights I said "BANG". That was the last time I've been hunting. I still go to the range when I feel up to it, and really enjoy going to the sheriff's range, even if it is open to the public just once a month. Even though I always ate the game I hunted and killed, the most important part to me was the thrill of the hunt. Even the years I spent chasing bunnies with my beagles for the tasty rascals,the hunt was what it was all about. The older I get (76)the more life becomes precious.I haven't killed a deer in several years, and probably never will again. I can buy a better piece of meat cheaper than the cost of hunting deer. I will not kill another animal, I won't eat Unless it's trying to kill me LOL! Two of my favorite game animals now is Grouse and Rabbit. I do buy a grouse stamp every year, and take a few. Rabbits are scares as hen's teeth in western Oregon so I don't hunt them anymore. I will always support hunting and encourage my kids and theirs to enjoy it as well. We're just not mad enough at the deer anymore according to my long standing Deer Camp host and retired SCDNR Wildlife Biologist. there it is. Its in the nature of man to kill to eat. Its a soft life, Mc Donalds and the liberals that have made it seem wrong. Like is allways said. If you eat beef, pork, poultry, or fish someone had to kill it. I guess I feel im responsible for my own. Just like having to put down my dog a couple years ago. Sure I could have went the easy route and dropped it off at the vet and picked up a box of ashes a week later. But he was my best friend and I didn't want a stranger as the last person he saw. He was my responsibility. Its the way its been since man first domesticated animals. We put down the sick and kill what is nessisary to eat. I chuckle at the touchy feely people that feel squeamish about killing a deer but have no problem buying a steak at the store. Sorry but it didn't come out of a garden or off a meat tree. A animal was killed like it or not. Now add to that we had a very harsh winter this year. Im sure MANY deer starved to death. You really think you did them a favor by not giving them a quick death and letting them face the cold and starving. This touch feely liberal world wants you to think that bambi is warm in santas house for the winter. Killing is just part of living. God gave us deer to eat not to decorate his sons birthday cards. the most important part to me was the thrill of the hunt. Most of my "hunting" is now with a camera. If I can get a good pictures I would of had a good shot. I encourage all young folks to hunt, kill, and consume. That said, I've only killed four deer in my life, but the best part is that each time I was hunting with one of my brothers. Plus, each time I had to just sit and admire them for a while. We're not talking touchy,liberal feelings here LLoyd. Most on here have dropped the hammer on many game animals in their lifetime.Like you, some of us have had to kill (put down) their pets for various reasons.You do a lot of control hunts,which isn't really a hunt imo . Nothing wrong with that where it's needed.Some just loose the blood lust as we get older.Not touchy feely,liberal feelings,and we don't suffer from the Bambi syndrome. were. Besides, I think Antelope taste much better than Deer anyway. I believe it is an age/mellowing thing. have harvested many deer over the years, but I likely won't hunt them any more. Nothing against hunting..but now I am alone and would never consume a whole deer in a year (I'm not a big meat eater anyway). I have a grandson who is a very successful hunter and doesn't waste game. I am now in possession of an "old timer's" "lifetime license", which is mailed to me each year. Of course, there are usually "antlerless deer" permits available..
We can sign over those permits, so I sign them over to my grandson...and he doesn't waste them.. Deer season is usually quite cold here, and it seems the cold seeps into this octogenarian frame much quicker than it used to.. I will likely hunt some small game such as woodchucks (groundhogs)...probably using either .22LR or .22 Mag..causing me to stalk..good exercise..